It has always been a tradition long held by Catholic retreat masters that when leading retreats that last for a considerable length of time, the very last conference is always one that centres around the spirituality and person of Mary, our Blessed Mother. The best is always reserved for the last, and this would be the spirit behind this tradition. There must be a myriad of reasons why this is so. She is considered the disciple par excellence of all the disciples of Jesus, and the one person whose heart and soul is open to God’s Spirit in the most docile and supple way. Her sinlessness places her head and shoulders above all other human beings who have ever walked the face of this earth, and who ever will. Even though scripture tells us that it was Mary Magdalene that the resurrected Lord appeared to first on Easter morning, it has been a long standing and honoured tradition of Catholic devotional belief that it was to his Blessed Mother that Jesus did first appear to. It is interesting to note that this has been supported by quite a few personal and private revelations. Though this tradition is not an article of faith per se, it is worth pondering over. What lies at the heart of this kind of reflection, which is speculatively theological in nature, is really the reflection on the nature of the relationship between mother and son. However, here is where it becomes truly special, requiring one to tread with extreme delicateness – it is a relationship of a very special mother and a very special son – that of a Mother who is a Virgin and a son who is Divine. It is a relationship that is far from normal, to say the least. But as we are still in Lent, and this is the last of the “Personalities to ponder in Lent” series, I would like to focus not so much on Mary as the one to whom the resurrected Lord may have first appeared to after he was raised from the dead, but what Mary’s disposition was at the life, passion and death of her son, and how reflecting on this really serves to aid us all in our spiritual journey of life. It is only in John’s account of the Passion of Jesus that Mary is mentioned. She isn’t mentioned in all the other three gospels. John has her standing near the cross of Jesus, together with her sister and Mary of Magdala. John provides a theological purpose for her being there. From the cross, Jesus casts his loving gaze on her and instructs his beloved disciple to behold his mother. He entrusts his beloved mother to his beloved disciple, and in so doing, gives her over to his care, and also gives her over to the Church that is now under her maternal care. It is a common explanation that Jesus never had any blood siblings, and that is why Jesus handed his mother over to his disciple to care for her from this point onward. What was Mary doing at the foot of the Cross? I truly believe that we stand to benefit and learn a lot from Mary if we spend some time pondering over this, and it is what Scripture doesn’t tell us that helps us. Why I say this is because Scripture doesn’t tell us that she was filled with anger and bitterness for what was happening to her beloved son. Any mother who witnesses the cruelty and inhumanity of a child will be somehow expected to demand for justice, with a face turned to the heavens and screaming for God to intervene and act. After all, she was told at the Annunciation that her child will be holy and that he will be called Son of God. The way things turned out for the Son of God certainly didn’t seem to auger well with how one would think an heir of God should be treated. What she beheld as she stood beneath the cross was a bruised, beaten, abandoned and dying Jesus. But there is no denying that there is something about Mary that is to be admired and respected. She had no demands even of God at that point. She didn’t shake her fist at the heavens and scream out in detest of how cruel God could be. But instead, she stayed at the foot of the cross. We hear of many young, and not so young people of our generation leaving the practice of the faith and many of them give the reason that they do not understand the faith. This is compounded often when their lives undergo afflictions and see how so many in the world are suffering in different ways. Many of them reason out that if God is all good and loving, that these and all other forms of suffering should not exist. While there are a lot of ways we can theologically broach such sentiments, they often are reducible to two things – that God is not a divine control freak, and that there is great value in faith when things are bleak. If God is a divine control freak, our love for him would never be one that is returned in full freedom. It will be contingent and predicated on the fact that we are not allowed to choose otherwise. Love, as we know, cannot be controlled. Controlled love is not love in the fullest sense of the word. Secondly, Mary’s attitude at the foot of the cross is one of humility and receptivity. She did not demand for an understanding of the divine plan of God. Instead of understanding, she stood under. She stood under the pain, under the mystery, under the weight of the Passion, she stood under the love of God that somehow also included loving those who hated him. Mary’s attitude at the foot of the cross imitates so closely Jesus’ attitude while hanging on the cross. In that way, mother and son were so closely united. When we ponder this deeply, I am quite certain that it will change our hearts when we face injustices and afflictions that have no earthly answers, and like Mary, stay firm in our faith and not abandon the cross. 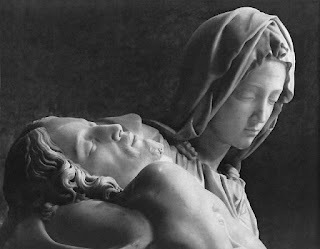 The serene and sorrowful countenance of Mary as she cradled the dead body of Jesus her son after it was taken down from the cross was captured so beautifully in Michelangelo’s Pieta and many say that his interpretation is unprecedented in Italian sculpture. Despite the trauma she had gone through, her face doesn’t display any resentment or scorn. In her silence, Mary does teach us something as she stood there at the cross. Love this para: "Mary’s attitude at the foot of the cross is one of humility and receptivity. She did not demand for an understanding of the divine plan of God. Instead of understanding, she stood under. She stood under the pain, under the mystery, under the weight of the Passion, she stood under the love of God that somehow also included loving those who hated him. " Thanks for writing! It also dawns on me how Mary was not resigned or defeated or fallen. She simply stood under. The meaning for her life doesn't give way when her son dies before her and in the most demeaning of ways. Instead she simply carries his shell at the end to acknowledge and love the body she brought into this mortal world. Simply beautiful. I remember you posted a Youtube video clip titled "THIS IS A SON", a song sang by Jody McBrayer in your blog. The last verse of the song, clearly described how Mother Mary felt at the foot of the cross where Jesus hung dying. I went through a very dark & bleak period after I suffered my second consecutive miscarriage. I remember thinking during a rosary session, "Yes, how blessed you are, Mary! Because you're the Mother of God, your pregnancy was a given; it will definitely be safe!" It was much later that I realized Mary, more than anyone else, would have understood my pain - she watched her Son die on the cross. Indeed, Mary's grace through pain & suffering is something we all can emulate. This powerful imagery of Mary, standing under the shadow of the cross casts a poignancy that is both intriguing and yet beckoning (to us Catholics)…….……..even enticing us to linger and ponder awhile the mystery of this woman who made it to the front cover of the National Geographic –2016,Dec issue - entitled “Mary, the most powerful woman in the world” How could that be when we are very sure that we can comb the Gospels and find that clues about her and her life were mostly elusive. Yet if we were to reflect on these sparse occasions we would find that she was there where it matters………mostly by her presence and acts of love to others reflecting the love/glory of God.